Thank you so much for stopping by and I hope you have a FABULOUS weekend!!! Oh, your daughter's class is going to love these!!! I really like the bright colors together. 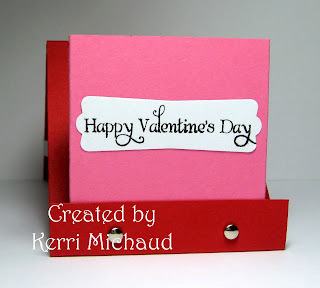 Wow, Kerri they are super cute and wonderful!Great idea! My word...you so totally ROCK!!! I am glad that I inspired you...but I am not too sure about being fabulous!! LOL!!! LOOOOOVE these! I love the circle nesties and the way you did the inside sentiment! YUMMY! Wow Kerri!! Now I am inspired by you and Jodi!! I so have to try these!! Stunning designs!! Perfect valentine treat!! How adorable! These are fantastic!! These are soooo sweet, Kerri! Isn't making things for our kids' school or their friends just the funnest thing to do? I hope you had fun making these...they get kinda labor intensive when you have to make 20something, but they're so cute and they are going to be well-received, so worth it! So jealous you know how to color - - these lil' guys are adorable! Too cute Kerri, they are fabulous girl! And oh yeah, Jodi does some amazing work too! I thought this set was cute but wasn't inspired enough to buy it...until now! Figures you would make it awesome! These are so sweet! Thanks for sharing tutorial, I went straight to my craft room & made one!! Oh, what a sweet project! 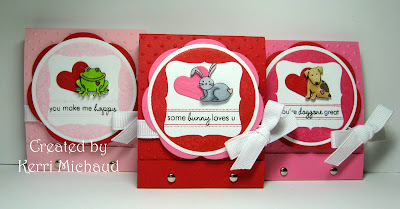 I love embossing, all the layering and very cute images!